I do love summer, but now that I’ve been living in California for 3 years, I am craving fall weather and food! You better believe this is my meal for the first day of September, when I can mentally justify soups with artisanal breads. 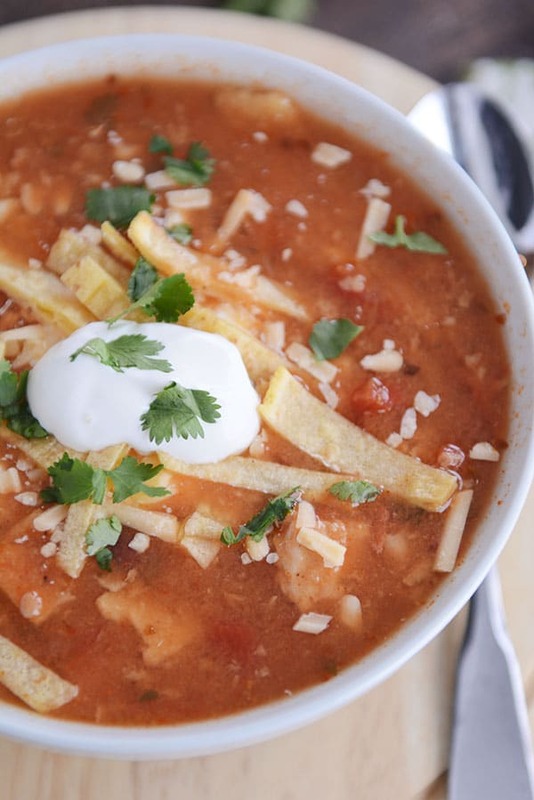 I am a forever follower of Mel from Mel’s Kitchen Cafe, and chicken tortilla soup is one of her star recipes. You can make it on the stovetop or crockpot but my preference is to make it in the Instant Pot which makes the process faster, more flavorful and makes me feel good about owning one! The ingredients for this soup are pretty basic things I keep stocked in my pantry, with a few extras including a jalapeno, a bell pepper and cilantro! It comes together quickly, and you can even make it ahead if your dinner hour is busy. It tastes great as leftovers too! Basically you have no reason not to make this soup! I use a shredded rotisserie chicken which makes the prep even easier. PRESSURE COOKER: Using the saute function, heat the olive oil and saute the onion, garlic, jalapeño and bell pepper for 2-3 minutes until the onion starts to soften. 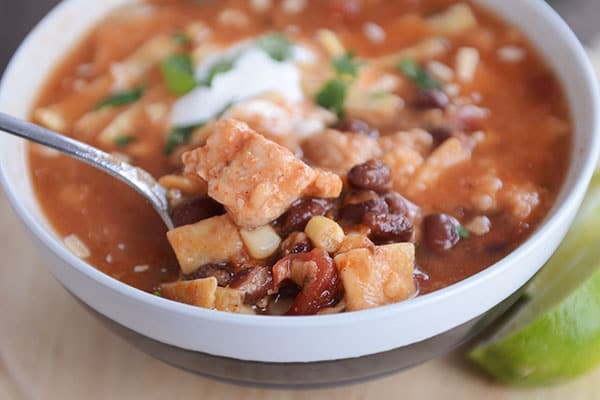 Add the salt, pepper, chicken broth, tomato sauce, diced tomatoes, black beans, chili powder, oregano, and cumin, chicken, and chopped tortillas. Stir. Stir in the corn and lime juice. Add additional salt and pepper to taste. Serve with desired toppings. STOVETOP: In a 4- or 5-quart pot, heat the olive oil over medium heat, and saute the onion, garlic, jalapeño and bell pepper for 2-3 minutes until the onion starts to soften. Add the salt, pepper, chicken broth, tomato sauce, diced tomatoes, black beans, chili powder, oregano, and cumin. Stir. Bring the soup to a simmer and cook for 20 minutes. Add the chicken and chopped tortillas; cook for 8-10 minutes more until the chicken is cooked through. SLOW COOKER: In a skillet, heat the olive oil over medium heat, and saute the onion, garlic, jalapeño and bell pepper for 2-3 minutes until the onion starts to soften. Scrape the mixture into the slow cooker (you can skip this pre-cooking step, but I like to do it since I find that sometimes the onions don’t soften all the way when cooking). Add the salt, pepper, chicken broth, tomato sauce, diced tomatoes, black beans, chili powder, oregano, cumin, chicken, and chopped tortillas. Stir. Cook for 4-6 hours on low or 2-3 on high. Stir in the corn and lime juice. Add additional salt and pepper to taste. Serve with desired toppings. Mel and I both like to add the corn tortillas while the soup is cooking. The tortillas soften and dissolve to create a really nice, thickened texture. I hope you’ll join me and make this recipe near the start of the fall season! No time to waste with a winner recipe like this. Everyone around your table will be talking about it!